Yukon Master Overhaul kits give you all the high quality parts you need to start & finish every differential job. Yukon offers more tailor-made kits than any other manufacturer in the industry to meet your specific installation needs. This kit uses Timken bearings and races along with high quality seals and small parts. Included in this kit are carrier bearings and races, pinion bearings and races, pinion seal, complete shim kit, ring gear bolts, pinion nut, crush sleeve (if applicable), oil baffles and slingers (if applicable), thread locking compound, marking compound with brush, and gasket. 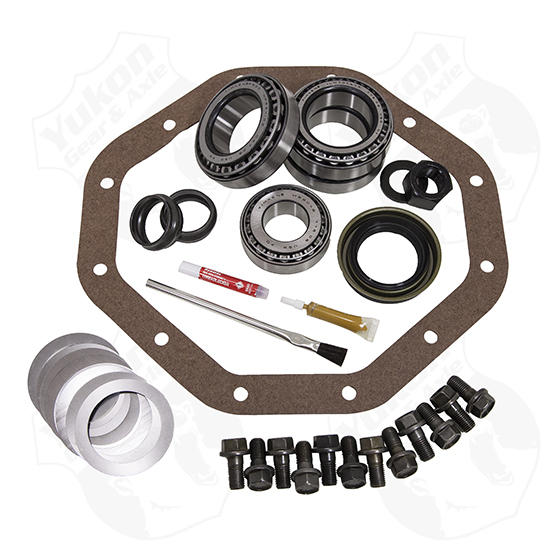 Yukon Master Overhaul kits are the most comprehensive and complete kits on the market. Yukon does extensive research to ensure that every kit is specially tailored to your application. Included are Timken bearings and races along with high quality seals and small parts. Included in this kit are carrier bearings and races, pinion bearings and races, pinion seal, complete shim kit, ring gear bolts, pinion nut, crush sleeve , thread locker, marking compound with brush, and gasket.